The shag is a popular dance most commonly associated with the beach towns of North Carolina and South Carolina. It is a two-person, male-led dance with a basic step that allows much room for improvisation and imagination. The dance looks deceptively easy but is actually quite complicated. The origins of the shag are slightly cloudy, but some historians trace its evolution back to early settlers of the Carolina colony who, in an effort to preserve their European musical lineage, formed the St. Cecilia Society in Charles Towne (Charleston), S.C., in the 1760s. Others trace it back even further to African roots. 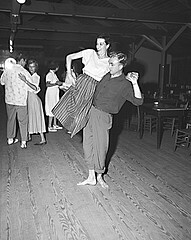 In either case, in the late nineteenth and early twentieth centuries, the slow grind jazz dances popular in some North Carolina and South Carolina clubs made their way to clubs in the Northeast, and dances such as the Charleston and jitterbug were born, leading eventually to the modern shag. Although the evolving shag was done to jazz and swing music in the 1920s and 1930s, the modern shag began gaining more popularity on the coast of North Carolina and South Carolina in the 1940s and early 1950s. Billy Jeffers-who deemed himself a "fast dancer," not a shagger-became one of the first "stars" associated with the dance during the 1940s and early 1950s. Next came names such as "Chicken" Hicks and "Big" George Linberry, who helped infiltrate the Carolina coast with the smooth sound of "beach music" and practiced the smooth steps that would become the modern shag. There were many beach club pavilions sporting dilapidated outsides and wooden dance floors where teenagers would sneak off and dance the night away. Probably the most famous of all of these dance clubs was the Pad in Myrtle Beach, S.C. In its prime, the shag became more than just a dance; it was a social phenomenon, with teenagers from all over the Carolinas drawn to its image of daring and excitement. The first use of the term "shag" most likely appeared in the early 1960s, just when enthusiasm for the dance was waning. In 1954 Hurricane Hazel had demolished most of the old dance pavilions and rock 'n' roll had surpassed shag music in popularity. The shag was revived in the early 1970s, however, when a competitive dance circuit formed in Atlantic Beach inspired a renewed interest in the dance. In the early 2000s, the Society of Stranders (S.O.S.) and the Association of Carolina Shag Clubs listed thousands of members, and there were estimated to be 800,000 people nationwide familiar with the dance. Bo Bryan, Shag: The Legendary Dance of the South (1995). Couple dancing or shagging, Nags Head, NC, 1948. From Conservation and Development Department, Travel and Tourism Division Photo Files, North Carolina State Archives, call #: ConDev7198D. Available from http://www.flickr.com/photos/north-carolina-state-archives/2431904558/ (accessed June 27, 2012). Shag Danciving With Charlie Womble and Jackie McGee, uploaded 12/14/2008 by Youtube user Swango1Cars. Available from http://www.youtube.com/watch?v=-YofTQCsSqQ (accessed June 28, 2012). Where can we go to see Shag dancers performing? Love what we've seen on You-tube. We had fun. Thanks to everyone who participated!